Depending on whom you ask, Seattle’s Syttende Mai celebration is the largest or second largest in the USA, meaning thousands attend each year, which may be some consolation to newbies who did not find parking and missed out on the fun. Having applied to march, we gave ourselves plenty of lead time, found a 10-foot pole for our flag and a choice spot on Market Street, and checked in at 5:30 pm for the 6 pm march. We were directed by a friendly official with a clipboard to wait behind a marching band. 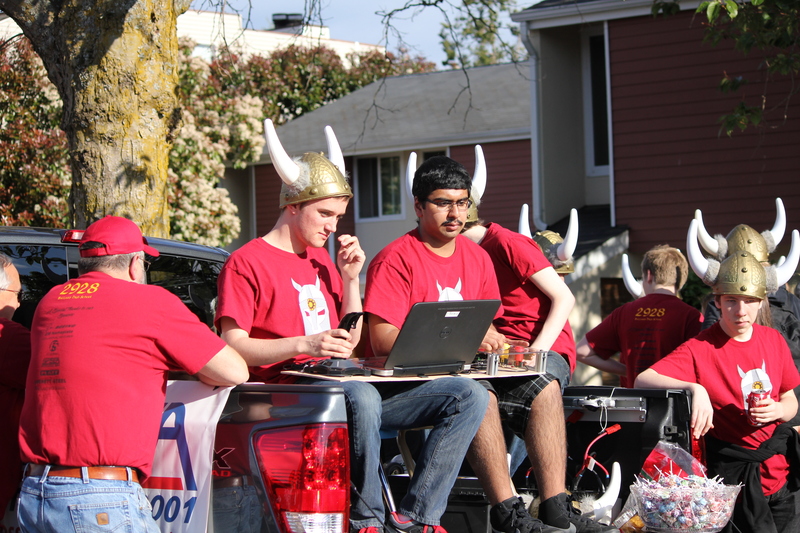 Near us, engineering students with Viking horns attached to their hardhats demonstrated a remote-controlled, Frisbee-tossing robot (very cool). Drill teams in white boots stamped in place in a parking lot. At the west end of the street, gorgeous Fjord horses endured caresses and the dramatically-pinched noses of passing schoolkids. The sun shone. Everyone seemed relaxed and happy. Shortly after 6 pm, the parade began to inch forward. 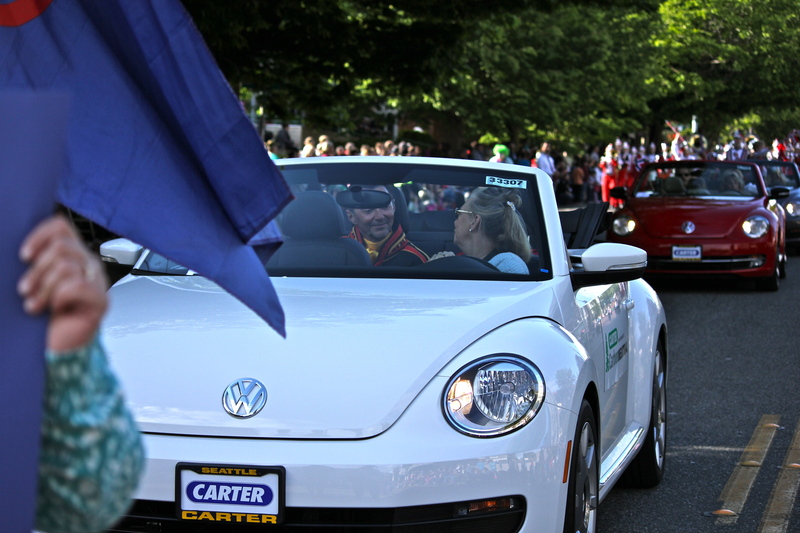 The same official approached, scolded us for “being late,” and directed us to “go to the front of the cars.” Surprised, we hustled forward, closer to the front of the parade, in front of the marshals’ cars (Volkswagen bugs on loan from Carter Subaru, in true multicultural fashion). I spied the Norwegian consul, whom I recognized from a luncheon earlier in the day. Where should we should march, I asked. “Behind the cars,” he said. We retreated, stopping briefly to greet Grand Marshal Bård Berg and his wife Bennie , resplendent in their gakti. We laughed. The problem with being a “first” in a century-old tradition is that nobody is sure what to do with you. 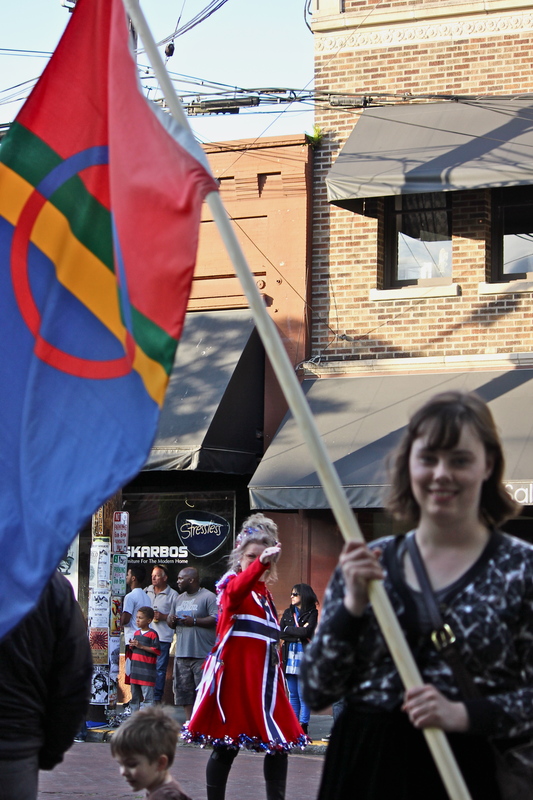 We weren’t in Norway, however, where bringing the Sámi flag to the parade can engender more than confusion. We fell into step and did our best to keep the banner straight and the flag high. Friends called our names from the sidewalks. A college roommate I hadn’t seen in years appeared before me, beautiful in her bunad. What a thrill! 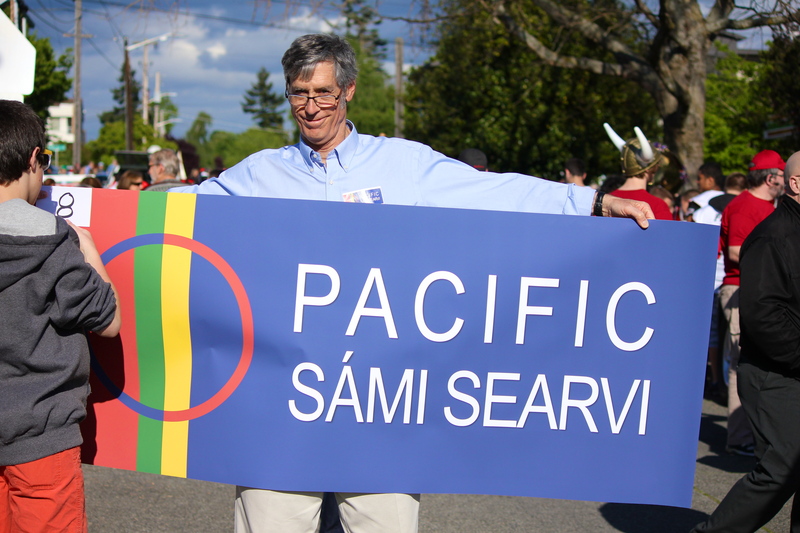 And what an honor for the searvi to participate this year with a Sámi grand marshal leading the parade. I was glad our fickle Seattle weather was smiling on Bård and Bennie. As we turned the corner onto Market Street, however, it began to sprinkle. “The foxes are having a wedding!” It was a brief sunshower and afterwards, the light was theatrical, making the flags around us glow. It was a golden moment for Pacific Sámi Searvi and our mission. Next year, there will be more of us, perhaps in gakti. It may take years to get it right, but a celebration of Norwegian’s constitution isn’t complete without including the amendment ensuring the right to inclusion for all its people. Check out the beautiful parade photos on the Post-Intelligencer website, and others here and here. All photos © 2012-2013 Julie Whitehorn. 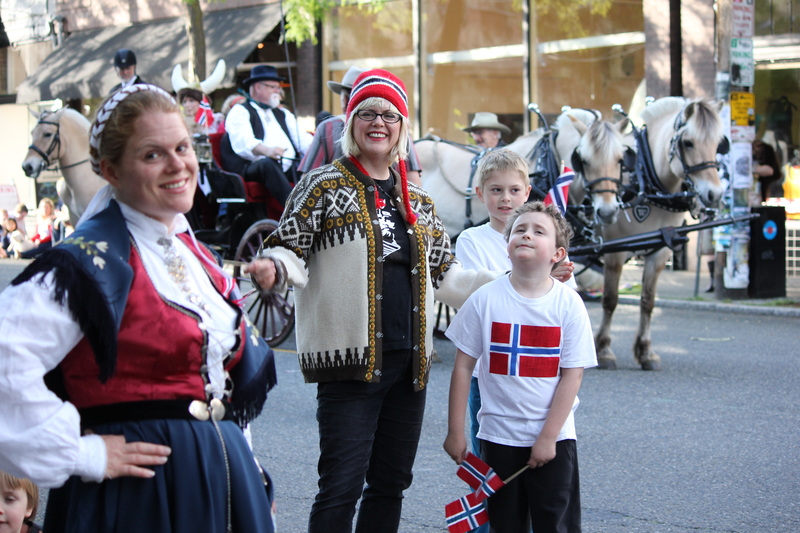 There will be notable Sámi presence in Seattle’s Syttende Mai parade this Friday, with a Sámi scholar for a Grand Marshal, and first-time-ever participation by Pacific Sámi Searvi, representing Sámi descendants and culture in the Pacific Northwest. 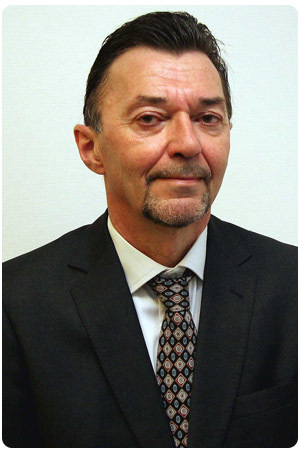 This year’s Grand Marshal is Sámi scholar Bård Berg, who teaches history and philosophy at the University of Tromsø. Berg lived in Seattle for a year while he was a Fulbright scholar at University of Washington’s Department of Scandinavian Studies, doing research on the immigration of Sámi people to the Pacific Northwest. 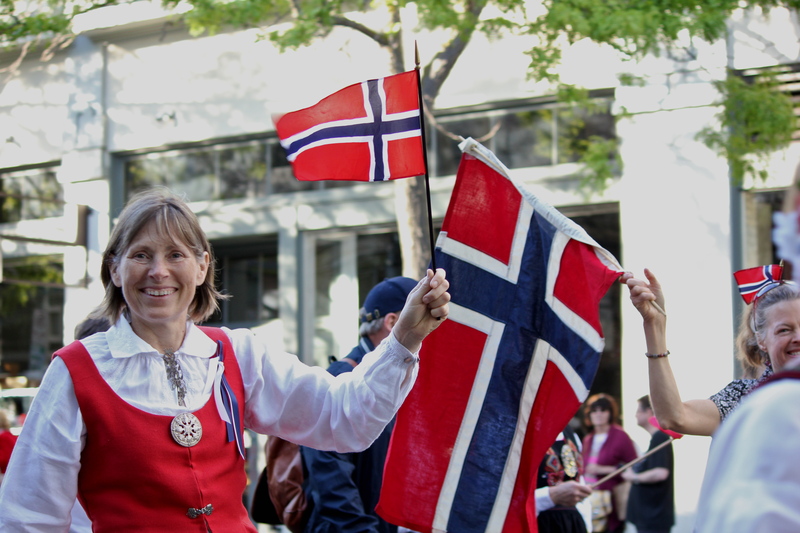 Syttende Mai is the celebration of Norway’s Constitution, signed May 17, 1814. Norway’s Sámi Act of 1987 provided the legal basis for Sámi participation in the government, and in 1988, Article 110a officially ended assimilation policies, stating, “It is the responsibility of the authorities of the State to create conditions enabling the Sámi people to preserve and develop its language, culture and way of life.” A year later, the first Sámi parliament convened in Norway, and in 1992, Norway passed the Sámi Language Act, making Sámi an official languages counties with large Sámi populations, namely five municipalities in Finnmark County and one municipality in Troms County. An estimated 20,000 Sami in Norway speak Sámi. 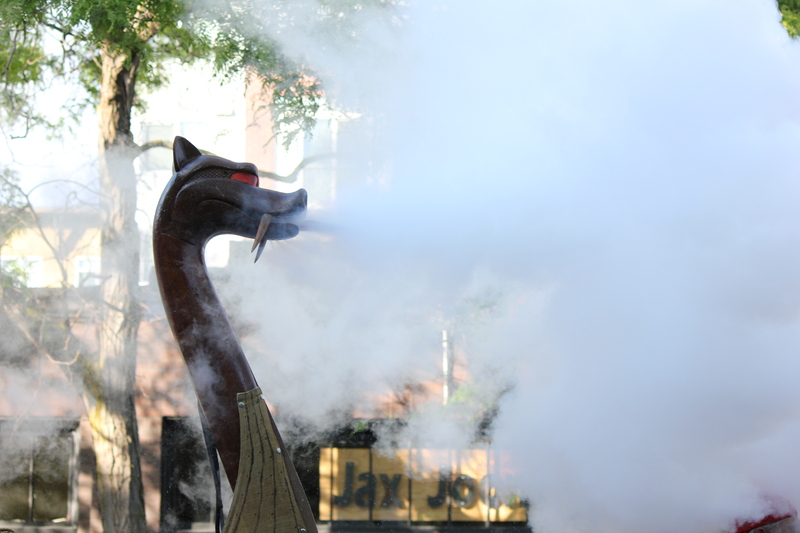 Throughout the day there are events to delight adults and children, including a luncheon at Leif Erickson Lodge, fjord horses at the Nordic Heritage Museum (where admission is free all day), and musical acts at Bergen Place. The parade, which starts at 6 pm, draws thousands of observers and includes over 100 marching bands, drill teams, community groups, and classic cars. 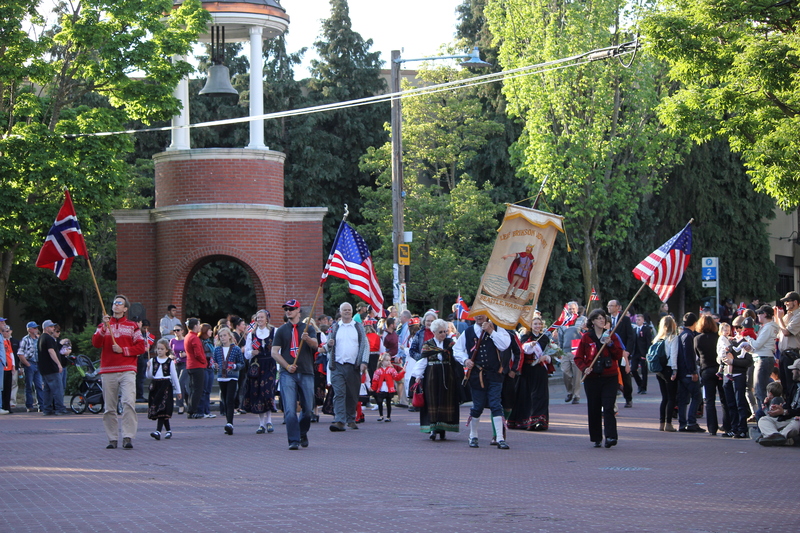 Seattle’s Syttende Mai celebration is the third largest (behind Osoo and Bergen, Norway) and has been celebrated here since 1898, before Washington was even a state. Check out the official site for more information. Want to walk with us? RSVP on Facebook or just look for the Sámi flag during check-in at Adams Elementary (28th and 62nd NW) and introduce yourself. The parade starts at 6 pm. Think sun, for children of the sun.